I’m tired of people telling me that Formula 1 drivers are athletes. How does it even meet the definition of what an athlete is? They have the easiest job in the world. Aren’t they just driving a fancy car in circles? Athletes are elite individuals that use their bodies for sport, not those who drive cars. What defines an athlete? The word athlete has Greek root Athlon, meaning ‘compete for a prize’. With that definition, yes – F1 drivers would be athletes. They compete in a total of 20 races for the ultimate prize: the Drivers’ Championship. But then, what about poker players? I play every night – am I considered an athlete too? Of course not. It’s because there are three fundamental aspects that define an athlete. a person who is trained or skilled in exercises, sports, or games requiring stamina, physical strength, or agility. BUT if you look closely, you’ll realise that F1 drivers actually display all 3 of these features. And it’s my goal to convince you why they are as much as an athlete as Cristiano Ronaldo, Serena Williams and Usain Bolt. Please watch the videos – they start at the exact time to enhance your understanding of the examples! Except, if you’re not fit, you won’t be able to handle the extreme conditions within an F1 car. One thing you’ll need to have is a physically strong heart. Why? Because the heart rate of an F1 driver (video below) will increase to a staggering 170 – 180 beats per minute. It’s beating non-stop over a 2 hour race. In fact, marathon runners have a heart rate of 170 beats per minute. If you consider marathon runners to be elite athletes, why aren’t F1 drivers considered in the same category? F1 drivers aren’t physically strong in the traditional sense. They don’t have showy biceps or chests like The Rock. That’s because they need to keep slim (around 65 kg) so that their car won’t be too slow by being too heavy. Instead, the physical strength of F1 drivers lie in their neck and core muscles. In this video, Fernando Alonso, double F1 World Champion, is cracking nuts. But not with his hands – he cracks nuts with his neck. Now if that’s not impressive, I don’t know what is. When F1 drivers brake from 300 to 0 km/hr in a matter of seconds, drivers experience a force called gravitational force (G). Normally, the weight of your head is around 7-8 kg including the helmet. However, with 5Gs of additional force, you essentially have 40 kgs worth of force trying to rip your head off when you brake. That’s like having 2 dalmatians pull at your neck while you are driving. If you didn’t have strong neck muscles, your head would smash right into the driving wheel. 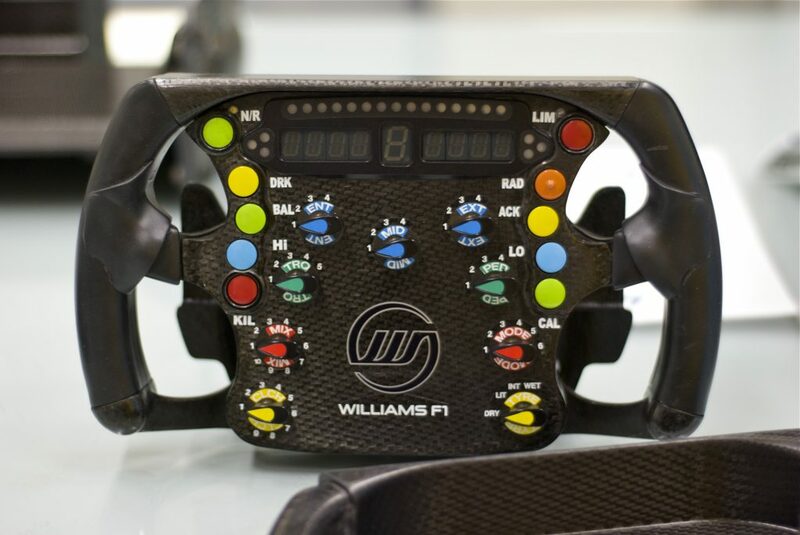 F1 drivers are able to resist this because they are elite athletes. They train to counter the effects of gravity when braking or speeding up. I’m not sure if any other athlete will have as strong necks as F1 drivers do. Let’s be real. Will your daddy or mommy actually be able to go through these conditions without being exhausted? Ah, this is where you’ve got me “F1 drivers don’t have agility because they’re stuck in their car with their driving wheel.” How can they even display agility? BUT the agility of F1 drivers is extraordinary. One way to test concentration and hand-eye coordination is by using a Batak reaction board. Buttons randomly light up on a structure and the goal is to hit as many as possible within 60 seconds – like whack-a-mole, but for athletes. In this video, two F1 drivers showcase their Batak reaction. An average bloke would manage around 50. F1 drivers? Between 70 – 80. This is similar to other athletes. In this video, two soccer players compete. Mignolet (who goes first) wins, but this can be attributed to his goalkeeping reflexes. His score is 37 in 30 seconds, which is around 74 in 60 seconds. Comparable to F1 drivers. A BBC journalist volunteered to go head-to-head against a F1 driver – Heikki Kovalainen. The result of the competition? The BBC journalist managed 47. Kovalainen’s friend in the Finnish air force got 101. Kovalainen? 121 (even amongst athletes, he’s just ridiculously gifted). Being able to react quickly in an environment with minimal signals is key to a successful race. Particularly when you’ve got a control pad that has more buttons than your TV remote. You’ve got to have your head in the game and be acutely aware of your surroundings. 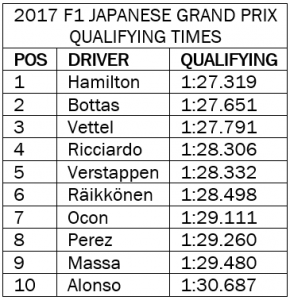 Japanese F1 Grand Prix Qualifying Times. Damn, those fine, fine margins. Like many other sports, F1 racing is all about fine margins. A second’s difference can determine if you are 1st or 5th. It can determine if you win the prize or remain as a competitor. Just like other sports: like swimming, like sprinting, like skiing. In fact, F1 drivers use 9 – 13 times their resting energy, which is similar to that of basketball and soccer players. F1 drivers are just as athletic as Cristiano Ronaldo, Serena Williams or Usain Bolt. If you combine all of these factors together: the extremely hot conditions that they drive in, the physically exhausting environment, the mental strain…and yet still have the capacity to concentrate and drive at high speeds without crashing, how can you not respect their athletic ability? I hope that the evidence I have presented can depict that there is more going on in F1 driving than you think. F1 drivers are comparable, if not superior in some aspects, to other athletes. A few of them, like Jenson Button, have actually taken a shot at the triathlon competing with Olympian athletes. It’s not an argument: F1 is a sport. F1 drivers are elite athletes. And it is not something that just anyone can do. BBC and Bleacher Report both have excellent articles on the athletic capabilities of F1 Drivers. One of the aim of my blogs is to inspire curiosity. We are all naturally curious – in fact all of these posts are questions that my friends have asked to explain. This post is inspired by Haylie and Michael who wondered what F1 drivers have to go through. If you have any questions, leave them below! Really cool article. Using a checklist to prove your point, a smart way of doing it. I hope the evidence is solid! They should be, you miss a lot that is going on when they are sitting in the car for the whole time. Wow JT, what a fantastic article. I liked how you used a checklist to prove your points, it made it flow nicely. And, you have convinced me that F1 drivers should be respected as athletes. Thank you Isaac. I have to confess that I too thought as them as only ‘drivers’, but there’s always more than meets the eye. As always, nice one JT! I too ignorantly accused F1 drivers as ‘non-athletes’ so I am grateful that you have enlightened me! Thank You Sushma. I hope the videos helped. Very good article! Made it interesting with your writing style. Keep it up!